Other names for Type Eight are the Chief or the Leader. They are motivated by the need to be in control. They avoid any sense of their own weakness and come across with a great deal of energy and physical presence. 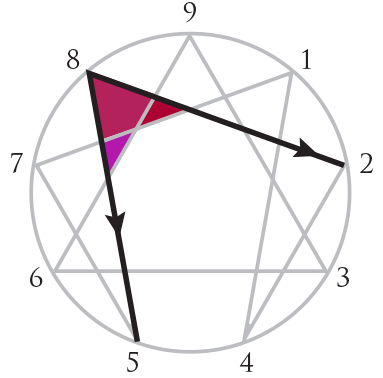 In the Body (Instinct) Center of the Enneagram, Challengers are the most obviously body centered. Those who identify as Eights have lost touch with their essential “aliveness” and so they try to recreate it with their power and will. They are in a self-protection mode, unconsciously believing that they will be hurt. When they have an opinion, you will hear about it, and they almost always have an opinion. It takes a great deal of discipline to hold the energy back or in. The Passion of Type Eight is Lust – a desire to take life on! Take no prisoners and surrender to no one. They control their own future and their own happiness. The Challenger’s Social Role – how they appear in the world – is that of “The Rock.” Their strength will bring justice and protection to the weak and vulnerable. An Eight friend is someone who will stand up and speak out for you. Each personality type has a Wing on either side. Through self-observation, you can begin to notice which of your Wings is dominant. Your dominant Wing influences the flavor and energy of your Type. The Challenger will be influenced by Type Seven, the Enthusiast, or by Type Nine, the Peacemaker. Some people report being affected equally by both Wings and some people report not being affected by either. Both of these cases are rare. We do, however, find that a person’s Wing can shift at different times in life. Under Stress, which might be caused by boredom or the “stupidity” of others who may have control over them, Eights will “move” to average Type Five, the Investigator, where they will withdraw and “think” about why they don’t fit in. In Growth, Eights “move” in a different direction, toward a high functioning Type Two, the Helper. They can become zealous with compassion and care for others.